It seems as if, nowadays, adventure games straddle one of two extremes. They are either interactive works of fiction that don’t offer much in the way of traditional challenge, or they are traditionally difficult point-and-click games with traditionally broken logic. Games that combine a rich story and world building like The Walking Dead without feeling like a DVR simulator are somewhat rare. Being one of those rare titles is what makes Technocrat Games’s Technobabylon a remarkable experience. Technobabylon offers up a compelling, unpredictable story set in a unique cyberpunk world, and it backs it up with solid point-and-click gameplay that keeps the story moving at a brisk pace. It is a throwback to the classic point-and-click titles from the ‘90s, and there are spots where it bears too much resemblance to those old titles for its own good. Despite its minor flaws through, if you are an adventure game enthusiast, Technobabylon should be near the top of your playlist. The world of Technobabylon is one of typical dystopian fiction. By the late 21st century, numerous technological advancements have been made. They should, in theory, have made life much better for the citizens of Earth but in spite of such advancements, Earth of 2087 is no better off than today. A Matrix style virtual reality called “The Trance” is available for citizens to enjoy, but has created a generation of addicts (known as “thralls”) who have no jobs and live in squalor in public housing. Advances in computing power have led to massive advancements in AI, but that AI is mostly put to use monitoring and controlling citizens. Genetic engineering has made stunning advances as well – advances that have been put to use for nefarious purposes, like genetically engineering children with explosive bones so that they can be suicide bombers. The genetic engineering aspect of the fiction is the strongest feature that Technobabylon brings to the table. 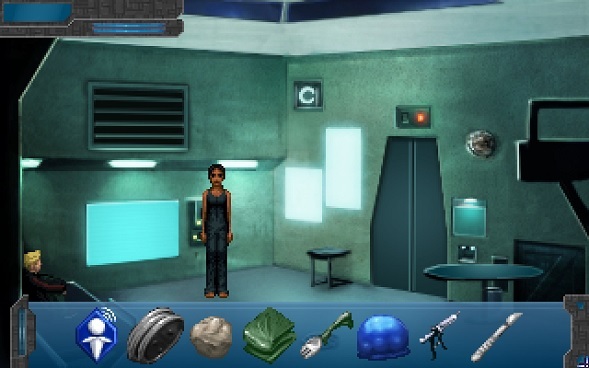 Whereas the computers in most futuristic movies just feature lots of flashing lights and computer chips, Technobabylon heavily explores the idea of organic computing. Supercomputers are a combination of silicon and genetically engineered organic goop. When it comes to technology and how it is used, the game is full of interesting ideas in areas that games have rarely explored. Technobabylon gets the most out of its world by brilliantly revealing it to you one little piece at a time. There is no codex and for a game with so much to learn and so much lingo, there are surprisingly few information dumps. Instead, the world is explained to you through events in its story, its grimy visuals, and comments in conversations. The game is content to tease you with hints about what is happening in the world and allow you to fill in the blanks. One excellent example of this subtle world building occurs when you encounter one of the genetically engineered suicide bombers. You arrive at a subway to stop a man threatening to blow himself up and take the subway station with him. Rather than finding a strong-willed warrior ready to sacrifice himself though, you find a disillusioned, barely sane drifter spouting religious nonsense. The man has lived a life of crippling pain, thanks to having been engineered to explode. Rather than feeling like a hero, the scene just makes you feel sad, as you wonder what kind of depressing state the world must have been in to allow this type of inhumanity. When you start up the game and you see its old school, pixelated graphics, you may get the impression that you are in for a lighthearted experience. You soon find out, however, that this game is nothing like the campy adventure games of yesteryear. The tone in Technobabylon is quite bleak. Some minor horror elements make an appearance, like a gruesome murder scene and some creepy androids imported directly from The Uncanny Valley. The tone is enhanced by the game’s moody soundtrack, which has a lot of typical Blade Runner or Mass Effect style techno music. It is a very good soundtrack, with a large variety of tracks that always seem to fit the situation at hand. The story consists of three playable characters. The first character is a “thrall” (i.e. a Trance addict) who spends all of her days hooked into the Internet, barely taking time out to eat and sleep. She gets pulled into a great mystery, however, when she walks out of her apartment one day and it explodes behind her. The other two characters are a couple of CSI style future cops who are investigating a series of cybercrimes known as “mindjackings”. Some nefarious hacker has stolen the consciousness of dozens of victims, leaving behind mindless husks or corpses in the process. These storylines intertwine as the characters encounter all kinds of twist and turns while unraveling the conspiracy lurking behind the mysterious mindjacker. Along the way, they encounter an overprotective AI, scientists with questionable morals, power hungry businessmen, and plenty of shady “Hacktivists” and underworld characters. Almost everyone in the game has well-written dialog and with a few exceptions, the voice acting is competent. The story has many of the familiar trappings of cyberpunk fiction but it is still a special one, thanks to the special twists that it brings to the table. It is brimming with imagination and many questions about the role that genetic engineering may play in our futures. To solve the game’s mystery, you engage in typical old school adventure gameplay: talking to NPCs, collecting items, and occasionally combining them or using them in the environment. You also occasionally jump into The Trance, since some of the problems have elements that are both real and virtual. The gameplay in Technobablyon is mostly an asset to the game, thanks to an abundance of puzzles that are moderately challenging, but not so much that they bog down its pace. The game finds that elusive balance between challenge and storytelling. For the most part, it avoids the absurd leaps of logic that have plagued the adventure games of the past, providing satisfying answers to most of the puzzles. The last chapter of the game is quite good, as it involves you switching back and forth between all three of the characters as they work in conjunction to reach the conclusion. You will still probably find yourself getting stuck sometimes and resorting to randomly combining everything with everything until you finally find something that works. And, the gameplay does possess one huge flaw that sometimes drags it down. It lacks a feature that has made many adventure games tolerable – the key that you can use to highlight all of the usable objects in an environment. The “pixel hunt” makes a very unwelcome return in this game. If you get stuck running in circles for a half hour, don’t be surprised if it is because you didn’t notice a little object that you could pick up or a drawer that you could open. It is a shame that the game does not have this modern feature, because it is the primary source for what little tedium the game has. Technobabylon is mostly old school, a trait that comes out strongest in its old school graphics. Except for the character portraits that pop up in conversations, the game looks like an early 1990s LucasArts adventure game. It is low fidelity and highly pixelated, with extremely crude animations and characters that are barely recognizable blobs. Thanks to some quality art direction, the game gets some mileage out of its visuals, especially its cityscapes. For the most part though, it is an ugly game. Whether this ugliness was a conscious design choice for nostalgia appeal or the product of a limited budget isn’t clear, but the game does suffer for it. Some scenes, like a gruesome murder that you discover early on, don’t have the shock or emotional value that they should because everything looks so pixelated. What objects are or how they function is often unclear without clicking on them to get a text description. The low fidelity visuals also contribute to the problem of not always knowing what you can grab from the environment and what you can manipulate. It is easy to miss out on a drawer or a wrench since so many useable items blend into the background. Minor problems aside, it is refreshing to play an adventure game that offers up a creative science fiction story while providing an optimal amount of challenge. Technobabylon doesn’t make you feel you are just a passenger along for the ride, nor does it make you feel like you need to be a mind reader to figure out how the developers want you to solve a puzzle. It is for those reasons that the game should be considered a success. Some better production values would have made the game more enjoyable in a couple of ways, but the game is still a very easy one to recommend. If you are a fan of cyberpunk stories or you just looking for an adventure game that rests in the Goldilocks difficulty zone, then you should give Technobabylon a try. Point-and-click adventures are great for presenting unique stories in video games. If you enjoy such an experience, then you may wish to dive into Lucid Dream, a surreal point-and-click adventure from the appropriately named Polish developer Dali Games. While the idea of a vengeful ghost terrorizing you through a computer chat window is an intriguing one, the game fails to deliver on that premise in any way that would make it a satisfying game. It is a poorly designed experience – one that you are better off seeing in a youtube video for free instead of paying five dollars for. Since Memoria’s less memorable moments are somewhat front loaded, probably the hardest thing to do in this game is to get past the first few hours. It is a worthwhile investment though if you are up to it. The story payoff is there. Memoria is a good game for adventure gamers who are looking for that payoff and aren’t put off by the game’s occasional dry spells. The Inner World is a dull and unsatisfying experience, punctuated by the occasional interesting story moment or line of dialog. Bjorn Thoren is a disgusting slob of a bachelor and, in general, a terrible person. He lives in squalor and eagerly eats just about any piece of food he finds on the floor, whether it is an apple core in a pile of garbage or the last few potato chips that have been sitting in an open bag for weeks. He isn't very bright and a failure at just about everything in life.